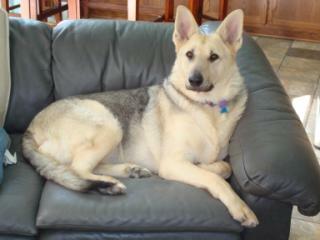 Today, Sally and I were forced to say goodbye to our beautiful German Shepherd, our HoneyBear. She apparently either swallowed, or was bitten by, some type of venomous insect, and went into toxic shock so quickly that she could not be saved. The Veterinarian did everything possible to bring her back, to no avail. She was a friend, a sweetheart, a light in our life; everything except a "pet". When Sally and I first laid eyes on the puppy that would grow up in our home, I was struck by her huge ears and paws. She was doted on by all the kids who worked in the pet store - when we asked to play with her in the puppy pen, the young man who brought her to us didn't really want to put her down! I finally had to convince him that we REALLY wanted to pet her and play with her, and he reluctantly relinquished her. Sally will deny this, but she and the puppy were immediately drawn to each other; so much so that I began planning a way to get them together. Two days later, I drove to the pet store directly from work and put a deposit on the pup. Sally's birthday was coming up, and I naively assumed that a puppy would be a GREAT birthday present. Those of you who have seen the movie "Marley and Me" know how it worked out - Sally's very first reaction when she saw the little girl was to say "What have you done!!" Bear's puppyhood was not ideal - the first three and a half months of her life had been spent in a pet shop. She had been taken from her mother before she learned how to socialize, drink from a bowl, or play. go' whenever they need to. There was a lot of frustration, on all sides, before Bear finally grew old enough to control her functions. I can very proudly say that we never yelled at, or punished, Bear for any of her "mistakes", but I did put in a LOT of time cleaning floors! Even though the original plan was for Bear to be Sally's dog, I found myself falling more and more in love with the pooch. Being a puppy mill baby, Bear's digestive and immune system had been compromised by the way she was conceived. She developed allergies to the strangest things - rice, chicken, some vegetables, lamb - you name it. AS soon as we identified one allergy, she would develop another. We finally had to put her on an expensive diet of herring and sweet potato kibble mixed, with of all things, instant oatmeal. As soon as we got her diet under control, a trip to the Vet for a weight problem revealed a thyroid deficiency, so we began giving her thyroid pills - coincidentally, the same prescription that Sally takes. 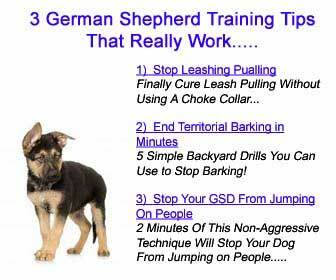 German Shepherds have a reputation for being fearless and very protective. Fearless was NOT in Bear's bag of tricks! She wasn't a coward, but she was very leery of any situation that might present a danger, and would always stay very close to me. Even though I have been through the heartbreak of losing a canine friend before, and well know the pain involved when the inevitable loss occurs, I fell head-over-heels in love with Bear. She became my friend and my confidant, and asked nothing more than to have a tennis ball thrown to chase after. The loss is still too new to fully sink in; I dread bedtime tonight - Bear always slept cuddled against my back, and we had our morning waking-up-time routine. I will miss her terribly, and I am not ashamed to say that I am crying bitter tears as I write this. Sleep in peace, my sweet Bear. I love you.